Meditation is the practice of concentration believed to have originated in ancient India, involving both the mind and body. It is the practice of attaining a state of calmness of mind through various methods. The calming of the mind, in turn, is believed to help bring physical and psychological balance, leading to overall health and wellbeing. A quiet location: A place that is peaceful and doesn’t allow many distractions like noise, and electronic media. Comfortable posture: Meditation could be done walking, sitting down, lying down, or in other positions (e.g. while doing yoga). Focus: Meditation requires attention. This comes with practice. Concentrating on the breathing is known to help with attention. Chanting (‘mantras’ like “Om”) and focusing on an object (e.g. a flower) have also been found effective in helping one focus. 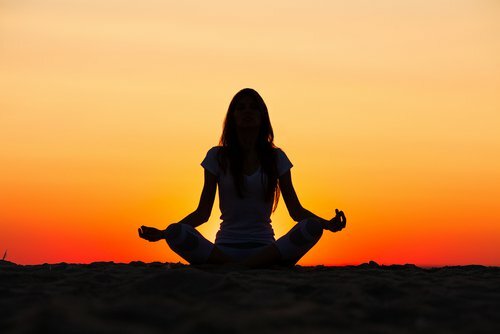 Based on the techniques used to help focus, meditations are classified into different types. Attitude: One has to understand that the mind cannot be brought to sharp focus and kept there (at least initially). Therefore, one has to be ready to forgive himself/herself for the wanderings of his/her mind. Concentrative: focusing on an object, an image, breathing, sound, or a flame. The mind will wander, but one could essentially bring the focus back to the ‘object,’ thereby allowing the mind to relax and calm down. The “transcendental” meditation is an example of a concentrative type of meditation. Mindfulness: a combination of concentrative and open awareness meditations. An individual could concentrate on a sense, such as breathing or walking, and still be aware of the surroundings. This is believed to bring about the clarity of thought. Guided: meditating under the guidance of a teacher or a recording. The instructions allow one to imagine a scene, a place, or an environment. This form of meditation engages many different senses simultaneously (smell, touch, and sight). With experience, the need for guidance is believed to decrease. Additionally, there are meditations accompanying different exercise forms, such as tai chi, yoga and Qigong. These forms of meditation focus on movement, breathing, balance, and concentration to bring about relaxation of the mind and body. Are there benefits associated with meditation? High blood pressure: Studies have shown that practicing meditation could help lower the blood pressure of those at increased risk of high blood pressure. Acute respiratory infection: In a randomized trial, patients with acute respiratory infection fared much better when they included meditation or exercise to their daily routine. Anxiety and depression: The technique of “mindfulness meditation” has been found effective in increasing acceptance, awareness, and compassion for individuals. This is believed to result in better stress management and thus, reduced anxiety and depression. Additionally, meditation has also been reported to reduce fatigue, anxiety, and depression in breast cancer patients undergoing radiation therapy. Insomnia: Randomized trials with individuals suffering from chronic insomnia find that “mindfulness meditation” is effective in improving sleep. Irritable bowel syndrome: Since meditation helps a person relax both in mind and body, it is believed to ease irritable bowel syndrome. In a randomized trial, women suffering from irritable bowel syndrome reported less severe symptoms when they included meditation in their daily routine. Smoking cessation: Meditation is known to influence areas of the human brain that are involved in self-control. There is evidence to show that a brief training in meditation improves self-control capacity in smokers, leading to reduced smoking. Immune function: “Mindfulness” based meditation and subsequent stress reduction have been found to have an effect on markers of improved immunity in individuals. Inflammation: “Mindfulness meditation” has been found to have a significantly smaller post-stress inflammatory response in participants of a trial than other methods. Meditation was also more effective in symptom relief from chronic inflammation. Menopausal symptoms: “Mindfulness meditation” has been found to render clinically significant relief to menopausal women from typical symptoms of hot flashes and night sweats. Pain relief: “Mindful meditation” has been found to bring about enhanced cognitive and emotional control, leading to reduced pain. Anyone can take up meditation. The practice does not need any specialized equipment or rigorous training. Nor does meditation require that one be present at a particular time at a specific place. One could meditate sitting down, walking, or even when riding a bus or train. All it needs is practice. Meditation allows an individual to focus, brings about the clarity of thought, and could offer different perspectives on situations when the mind is relaxed. It could restore peace and a sense of wellbeing. It appears, therefore, that meditation could benefit each and every type of human being, leading him/her to a life of reduced stress, anxiety, depression, pain, and better overall health. Brook, R., Appel, L., Rubenfire, M., Ogedegbe, G., Bisognano, J., Elliott, W., . . . Rajagopalan, S. (2013). Beyond Medications and Diet: Alternative Approaches to Lowering Blood Pressure: A Scientific Statement From the American Heart Association. Hypertension, 61(6), 1360-1383. Barrett, B., Hayney, M., Muller, D., Rakel, D., Ward, A., Obasi, C., . . . Coe, C. (2012). Meditation or Exercise for Preventing Acute Respiratory Infection: A Randomized Controlled Trial. The Annals of Family Medicine, 10(4), 337-346. Edenfield, T., & Saeed, S. (2012). An update on mindfulness meditation as a self-help treatment for anxiety and depression. Psychology Research and Behavior Management, 5, 131-141. Kim, Y., Kim, H., Ahn, S., Seo, Y., & Kim, S. (2013). Effects of meditation on anxiety, depression, fatigue, and quality of life of women undergoing radiation therapy for breast cancer. Complementary Therapies in Medicine, 21(4), 379-387. Ong, J., Manber, R., Segal, Z., Xia, Y., Shapiro, S., & Wyatt, J. (2014). A Randomized Controlled Trial of Mindfulness Meditation for Chronic Insomnia. Sleep, 37(9), 1553-1563. Gaylord, S., Palsson, O., Garland, E., Faurot, K., Coble, R., Mann, J., . . . Whitehead, W. (2011). Mindfulness Training Reduces the Severity of Irritable Bowel Syndrome in Women: Results of a Randomized Controlled Trial. The American Journal of Gastroenterology, 106(9), 1678-1688. Tang, Y., Tang, R., & Posner, M. (2013). Brief meditation training induces smoking reduction. Proceedings of the National Academy of Sciences, 110(34), 13971-13975. Fang, C., Reibel, D., Longacre, M., Rosenzweig, S., Campbell, D., & Douglas, S. (2010). Enhanced Psychosocial Well-Being Following Participation in a Mindfulness-Based Stress Reduction Program Is Associated with Increased Natural Killer Cell Activity. The Journal of Alternative And Complementary Medicine, 16(5), 531-538. Rosenkranz, M., Davidson, R., Maccoon, D., Sheridan, J., Kalin, N., & Lutz, A. (2013). A comparison of mindfulness-based stress reduction and an active control in modulation of neurogenic inflammation. Brain, Behavior, and Immunity, 27(1), 174-184. Carmody, J., Crawford, S., Salmoirago-Blotcher, E., Leung, K., Churchill, L., & Olendzki, N. (2011). Mindfulness training for coping with hot flashes. Menopause, 18(6), 611-620. Zeidan, F., Grant, J., Brown, C., Mchaffie, J., & Coghill, R. (2012). Mindfulness meditation-related pain relief: Evidence for unique brain mechanisms in the regulation of pain. Neuroscience Letters, 520(2), 165-173.